Every year Pax Christi members around the country commemorate the anniversaries of Hiroshima and Nagasaki on the 6th & 9th August. This year is even more important as we mark the 70th anniversary of the first use of nuclear weapons and mourn that they are still with us – 70 Years on! In 1945 the death toll in Hiroshima was estimated at between 100,000 – 180,000 and in Nagasaki between 50,000 and 100,000. 70 years on and nine countries, including the UK, possess more than 17,000 nuclear weapons. Trident, the UK weapons programme, is eight times more powerful than the atomic bomb that was dropped on Hiroshima. 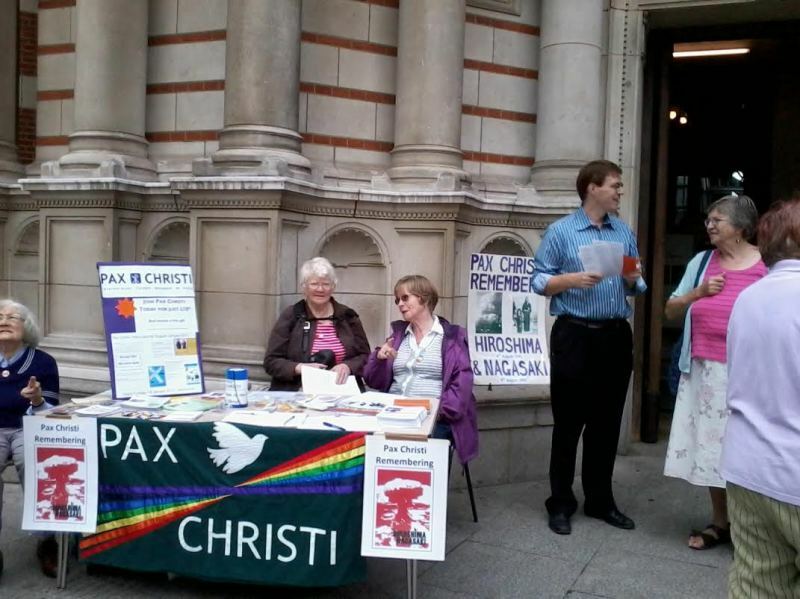 This year Pax Christi members in London, Liverpool, Coventry and Kent will hold vigils and run information stalls on the anniversaries of the bombs dropped on Hiroshima and Nagasaki. In London, a stall and times of prayer will be held outside Westminster Cathedral on 6th August between 10.00 am – 5.00pm and on 9th August between 1.30 pm and 5.00pm. In addition, the Pax Christi ICON of Peace will be on display in St Patrick’s Chapel, Westminster Cathedral, for private prayer and reflection for peace, between 3rd and 17th August. In Liverpool there will be a stall and display in the Metropolitan Cathedral between 10.30am and 3.00pm on 6th and 9th August. In Coventry, the Annual Hiroshima Vigil will be held in the Chapel of Unity at Coventry Cathedral at 6.00pm on 6th August. In Aylesford Priory, Kent, a vigil will be held in the Choir Chapel from 8.20pm on 6th August.